The members of the subfamily Holocentrinae are called squirrelfish while the species belonging to Myripristinae are known as soldierfish. 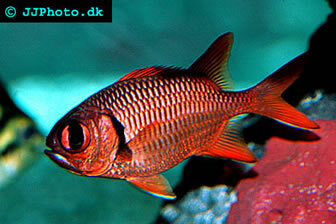 Many species of squirrelfish and soldierfish are known to be hardy in the aquarium. With their quick and jerky motions they will add action to the aquarium and they can also produce a chattering noise by grinding the teeth in the throat and stretch muscles against the long gas bladder. Squirrelfish and soldierfish should ideally be kept in an aquarium that resembles their native environment, i.e. an aquarium where they can seek shelter in caves and under ledges during the day and have plenty of space for swimming and searching for food during the night. Young quirrelfish and soldierfish are known to live in aggregations in the wild, while adult specimens prefer to live alone. Adults are however generally not territorial and it is usually possible to house more than one specimen of a species in the aquarium without any violence. They are also known to get along well with other Holocentridae species as well as fish from other families. Placing quirrelfish or soldierfish in a reef aquarium is risky, because these fishes are fond of eating crustaceans. Their mouths are expansive and they can swallow remarkably large animals. If you have a problem with too many bristles in the aquarium, squirrelfish and soldierfish will be happy to help out. Squirrelfish and soldierfish live in tropical parts of the Atlantic, Indian Ocean and Pacific Ocean. The greatest species diversity is found near reefs in the Indo-Pacific. They are only found in marine environments, never in freshwater or brackish conditions. Most species prefer shallow water down to a depth of 100 meters (330 feet), but some species, such as the soldierfishes of the genus Ostichthys, can be found down to 200 meters (660 feet). Squirrelfish and soldierfish will typically stay hidden during the day, e.g. under a reef ledge or in a crevice. They are known to hide together with sweepers, bigeyes and cardinalfish. During the night, they will live their hideouts and use their large eyes to search for food in the dark. Young quirrelfish and soldierfish will usually form aggregations, while adult specimens prefer to live alone. They are general not territorial. Squirrelfish and soldierfish can make sounds both above and below the surface by grinding their teeth (the ones in the throat) together and stretch muscles against their long gas bladders. In the aquarium, it is best to provide the fishes with live or at least fresh meaty foods. You can for instance feed your squirrelfish shrimps and small livebearers, while your soldierfish is given various zooplankton-sized meaty foods. They prefer to eat when the aquarium is dark. If your fish refuses to eat, carry out a major water change and try to entice them with live shrimp when the aquarium is dark. Squirrelfish and soldierfish do not guard their offspring. Myripristis species have been observed spawning in open water a few days after full moon.